The Skye Airstrip at Ashaig between Broadford and Kyleakin. 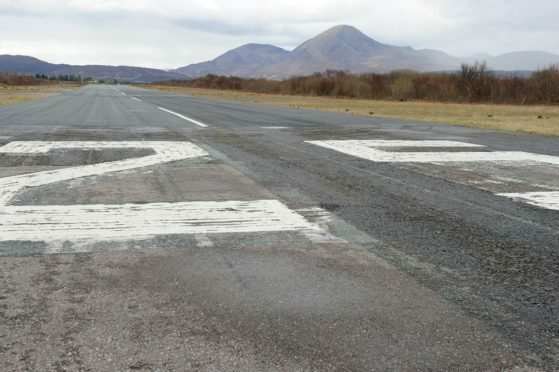 Ambitious plans to re-open an airport on Skye after 30 years are taking off with a trial to introduce flights to Glasgow or Edinburgh being investigated. A working group is to be created to develop how a scheduled passenger air service linking the island with the Central Belt could be established, flying out of Ashaig Airfield near Broadford. The move by public transport body Hitrans was welcomed by Ross, Skye and Lochaber MP Ian Blackford, who said: “I am convinced that if flights could be resumed from Skye that there will be sufficient demand to support flights to the central belt of Scotland and beyond. A spokesman for Hitrans [the Highlands and Islands Transport Partnership] said: “The focus of the [working] group will be to determine the feasibility of an option without in any way prejudging funding and delivery of that option. The spokesman added that the working group would be asked to identify and implement the necessary investment required to support the establishment of a pilot scheduled air service between Skye Airport and the Central Belt. It also aims to ensure that all necessary technical, operational and licensing requirements for establishing scheduled air services from Skye airport are addressed and advanced with a view to achieving this proportionately with the pilot nature of the air service establishment. It will also investigate the capital expenditure and operating costs required to support a pilot and consider opportunities for fundings. It is proposed that the group should have representation from Hitrans, the local authority, HIE, Highland and Islands Airports, Transport Scotland and Loganair. Loganair ran services from Ashaig Airfield, near Broadford, to Glasgow until 1988. Loch Lomond Seaplanes still uses the strip for scheduled flights. The strip near Broadford was built in the 1970s by Army engineers, and appears briefly in a scene from the 1980 film Flash Gordon, which starred Sam J Jones, Max von Sydow, Timothy Dalton and Brian Blessed. The strip remains available to the emergency services. A previous study has calculated that over 30 years the flights could generate in the region of £36million to £46million, depending on whether nine-seat or 19-seat aircraft were used.